The reed bed receives the grey water from the hand basins and sinks in the busy restaurant. http://www.airfield.ie/cafe This grey water is pumped to the top of the system to be treated and purified as it passes down through the various steps of treatment. Plants such as reeds and yellow flag irises that grow in the beds along the way have the ability to purify this grey water for recycling. These aquatic plants have matured well in the Airfield system. The reeds have the ability to grow quite tall. The treatment of grey water for the purpose of recycling is a requirement of the European Urban. See COUNCIL DIRECTIVE (91/271/EEC) on 21st May 1991 concerning urban waste water treatment. In it, it states in Article 12: “Treated waste water shall be reused whenever appropriate.” With water supply shortages possible in places such as Dublin, this grey water treatment and reuse is something we should all be doing for all new houses. The clarity of the final treated outlet water can be seen on the right. This is the water goes back to flush the toilets. The photo shows the view looking down from above. Unlike the inlet grey water this treated water for reuse is very clear and transparent and does no have any smell or odour at all. The system has been successfully in operation for the past 3 years. The report from the staff at Airfield is that the treated water has had no issue concerning stale bathroom smells and has had no water stains or cloudiness in the recycled flush water ever. This sample was taken from just after the pumping chamber and its obvious to see just how badly polluted it was. The Irish Building Regulations Part H, in implementing the EEC Directive sets standards for the treated recycled water that must be achieved for various uses. A water sample at the end of the reed bed was also taken. 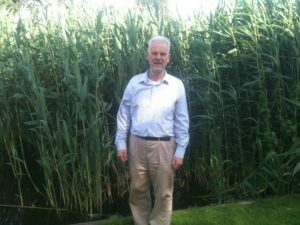 The Herr Reed Bed at Airfield has achieved the following treatment standard and the finished water is therefore well within the Irish National Standard for reuse for WC toilet flushing. 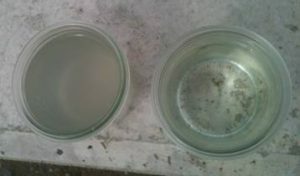 The above results show just how clean and how safely the grey water can be treated with the Herr system. This water recycling system incurs pumping costs and requires about 6 hours of reed straw cutting and weeding every year. It’s therefore a system for gardeners. Once this garden work is done however the Herr Reed Bed will be reliable and robust. In situations where a single house relies on a mains supply for drinking water, but has to treat its own waste water on site, it is now possible to split grey water from the kitchen and toilet waste water to treat them separately. The kitchen and toilet waste water would be treated for final disposal while the grey water can now be treated for the purpose of reuse and recycling. In this way mains water charge for the household can be reduced.